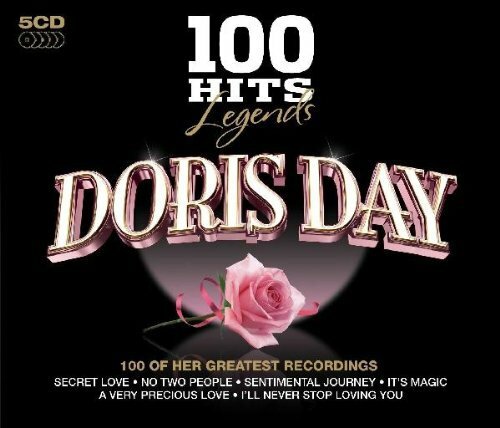 Doris Day - 100 Hits Legends by 101 DISTRIBUTION at WA Tunes. Hurry! Limited time offer. Offer valid only while supplies last. 2009 five CD set containing 100 classic tracks by this legendary artist, one of the biggest selling and best remembered musical icons of all time. 2009 five CD set containing 100 classic tracks by this legendary artist, one of the biggest selling and best remembered musical icons of all time. The five discs are housed in striking contemporary packaging, embossed slipcases and the booklet includes an artist biography. Includes 'Que Sera Sera', 'Secret Love', 'Confess', 'A Guy Is a Guy' and many more. DMG 100.